NBC is teasing its new fall season with a tightly edited promo featuring some of its biggest stars along with a homage to its trademark chimes and a hint at what may be a new branding element. The spot features stars including “Law & Order: SVU” star Mariska Hargitay, “This is Us” stars Mandy Moore and Milo Ventimiglia, “Chicago Med” cast members S. Epatha Merkerson, Oliver Platt and “Chicago PD” star Jason Beghe and his trademark gravely voice and “Chicago Fire” star Taylor Kinney. The spot starts with “Voice” coach Jennifer Hudson, “Chicago Fire” star Jesse Spencer and Hargitay playing the NBC chimes on a small set of tone bells. The spot ends with “The Voice” judge Blake Shelton and “This Is Us” stars Chrissy Metz and Sterling K. Brown humming the three tones. Following this is the colorful animated peacock element that appeared before the Primetime Emmys on Monday, Sept. 17, 2018, and has popped up occasionally other times. The element, which combines an iridescent, prism motif that unfolds into the glossy NBC peacock icon the network has been using for several years, appears to be a new element NBC will be using — and could be indicative of the look of a new look for its branding package, along the same lines as the “Aperture” look ABC has unveiled. Networks typically change out their branding graphics every season or so. 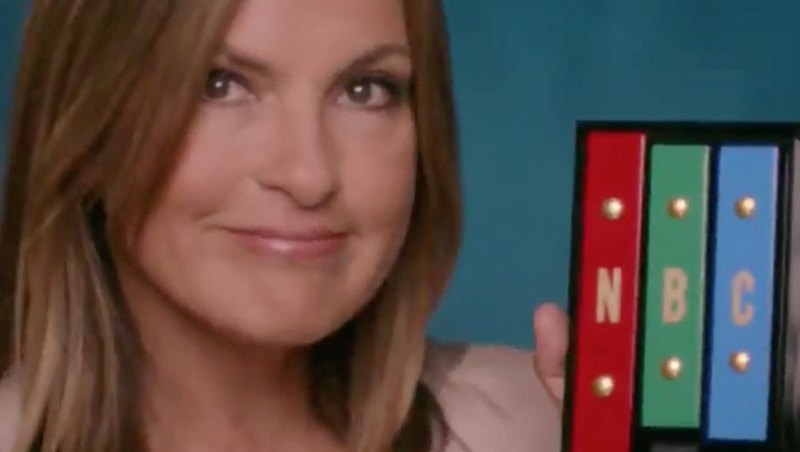 NBC’s promo also includes the line “America’s most watched network,” a tagline the network has been using for some time now, but also has similarities to ABC’s new “America’s Network” slogan.